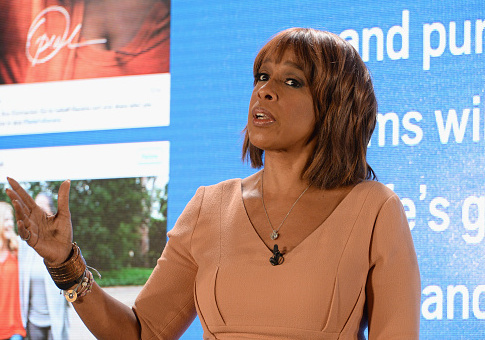 CBS anchor Gayle King on Friday defended her recent vacation with Barack and Michelle Obama, saying that it was not political. King, a co-host of "CBS This Morning" who donated thousands of dollars to former President Obama's reelection campaign, raised questions about her impartiality as a journalist after it was discovered that she vacationed on a yacht with the Obamas. The yacht vacation occurred in Tahiti and included Tom Hanks, Bruce Springsteen, and Oprah Winfrey. During Friday's airing of "Access Hollywood," King was asked about the controversy at a Variety magazine event honoring powerful women in New York, NewsBusters reports. "My vacations are not political and so I went on vacation with a great group of people, and to me, that's not a political statement," King said. "Last time I checked, he wasn't in the White House anymore," King continued. "So, I went on vacation with friends. That's how I see it." King dismissed recent reports that her co-host Charlie Rose and other journalists at CBS News were upset with her over the vacation, seeing it as a slap in the face. King was honored at the Variety event along with former first daughter Chelsea Clinton. This entry was posted in Culture and tagged Barack Obama, CBS, Michelle Obama. Bookmark the permalink.